I looked at my husband-to-be as he sat on the chair in his mother’s bedroom, laughing and joking with his siblings. It was December, 1968, and ever since we had arrived in Algiers that afternoon, more and more Kabyle words had been slipping into his French, until now he was talking practically all the time in his mother tongue. All the members of his family sat in a half-circle around him, perched on the bed, the arm of his chair, the floor — anywhere they could get close to him and hang on his every word. Leaning back in his chair, relaxed, with one foot resting on the other knee, T was the centre of attention — which is where he always liked to be. But then, his family had ample reason to hero-worship him. At the age of sixteen, following their father’s death, he had saved them from a miserable life eked out in the mountains of a country at war, where death would have stalked them every day; only a rifle-shot or a burst of machine-gun fire away. He had also lived the impossible dream — in that period of post-independence euphoria, he had left Algeria to go to Europe to study and returned, four years later, his Master’s degree safely in his pocket, to a top-ranking job in Sonatrach, the most prestigious of all Algerian national companies. Not only that, but he was now introducing me, his English girlfriend, to them and announcing his intention of marrying me the following summer. “He is home,” I thought, looking at his animated face, absorbed again into his family on the soil that had nourished him and made him what he was. I was on the outside, looking in — a stranger. Although I could understand most of what was being said in French, the conversation would suddenly veer into Kabyle, leaving me stranded. I would blink and, with a strained smile, pretend I could understand what was being said, following everybody’s lead by nodding and laughing in the right places, exchanging glances of complicity with T’s brothers, and trying to paste an interested look on my face. Sometimes, one of them, taking pity on me, would lean over to translate into French the general gist of the discussion. Later, at dinner, I felt slightly reassured when I felt T’s knee pressing against mine underneath the table — a substitute for holding hands, which he said we should not do in public. Especially in front of his family. It all seemed rather strange to me, as his mother had prepared her room for us, spreading crisp new sheets on the bed and plumping up the pillows. Strange because we were not yet married and could not hold hands and yet his mother had seen no impropriety in us sharing a bed. T. had shaken his head when his mother had taken him aside to inform him, in a whisper, about her preparations. In the same way as he would refuse even to kiss me chastely on the cheek in the presence of my parents, he told her in no uncertain terms that he would not share a room – and a bed – with me under the family roof until we were married. It may seem hypocritical to you, as we had been together for four years, but, looking back, I prefer to think of it as respect for his family. The language problem became less of one as the years passed. Although I never reached the stage where I could understand every nuance of Kabyle, I soon became able to follow what people were saying, and could join in from time to time, even though my contributions to the discussion usually consisted of verbal prompts with which I could ensure the smooth flow of the conversation, and nudge forward the other person along it, a little like a tug manoeuvring an ocean liner into position. 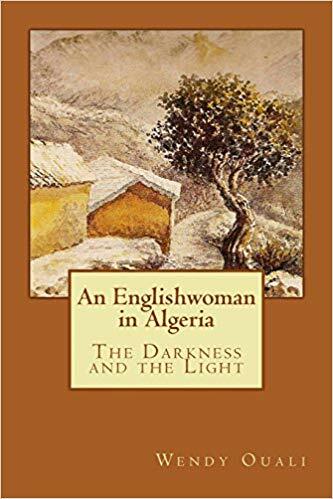 It worked wonderfully well with my mother-in-law and, in this way, we could enjoy discussions in Kabyle lasting an hour or more on subjects ranging from her father’s fatal heart attack to World War Two. Sometimes she would glance at me to gauge my reaction, her head cocked to one side like a plump little wren, and on receiving my murmured approval, she would give a satisfied nod and sail blithly on. It wasn’t just the language, though. During that same dinner, my first in T’s family home, I had looked around me at everyone yelling at the top of their voices. “Why are they shouting so?” I whispered to T above the noise. “They’re not,” he answered, turning to look at me and frowning, his eyebrows drawn together, “They’re just talking.” It was all so different, but the difference was not what I feared the most. It was the opprobrium that might be heaped on my head for not following the rules of Algerian social conduct. To me, that was worse that not understanding the language. It seemed to me that his was a world in which either you grew up or where you remained for ever an outsider. And perhaps, if that was what it would have taken to keep me in his life, T might have given up that world for me, although I doubt it. But when the first intensity of passion had passed, he would have regretted it, and blamed me. I was the one who had to enter his life and adapt, not the other way round. The years passed, and yet I still stuck out like a sore thumb. Physically, although my hair was dark – much darker than T’s — I still had that indefinable something that marked me out as European. I was a couple of inches taller than most Algerian women, but that and my un-waif-like proportions should not have been enough to make me stand out in a crowd. Perhaps it was the look of mild panic in my eyes at the prospect of shopping in the local market, dancing at a family wedding or catering for a dozen unexpected guests. It seemed to me that our early years were a series of negotiations, which T usually won. One of these was our differing perceptions of home. To T, it was a social space, and he was never happier than when it was bursting at the seams — to me it was a private retreat, where I could regain my sanity and lick my wounds. After a while, however, I realised that I was finally at home with the idea of “foreign-ness.” I gave up trying to fit in and adopted T’s philosophy, which was, “Here I am. This is what I am. Take it or leave it.” I was lucky in that my family-in-law opted to take it, not without heaving an exasperated sigh at my lack of social nous. At a wedding. I look so calm and collected – on the outside. Being an outsider, however, gave me a more clear-sighted view of Algeria’s political situation. I had not been through the horror of the independence war and so was not taken in by some of the more questionable decisions taken by its political leaders immediately after independence and in the decades that followed. I wasn’t emotionally involved in the same way as T., and so could be more objective. I would look at various initiatives with a jaundiced eye, as for example, the constant emphasis on “socialism” being an irreversible choice, the whipped-up hysteria surrounding the Moroccan annexation of the Western Sahara, or the (obligatory) voluntary tasks carried out at weekends by the Sonatrach workforce. I kept my opinions to myself, however, as I had no wish to burst T’s bubble. Luckily, he was to reach the same conclusions as me, but much later. To me, those first few months and years were a swirling, chaotic kaleidoscope of sound, noise and colour. All I could do was to cling on to T like a lifeline, close my eyes and ears to the bedlam and focus on his calm presence. Whenever I was faced with a challenge that seemed impossible, I would grit my teeth, thinking, “I can do this and I will. This is a test and I will pass it.” There were many such tests to come. This entry was posted in Algerian Etiquette, Family, First Visit, First Year, Languages, Maison Carree and tagged Algerian languages, Algerian Social Customs, Kabyle. Bookmark the permalink.